Maryland Club Pure Rye Whiskey was originally produced at the Cahn, Belt & Co. facility in Baltimore, Maryland. It was sold from 1870 until 1919, supported by creative ads and marketing. The brand enjoys a unique role in history as a date book with an ad for Maryland Club was found on the Titanic. 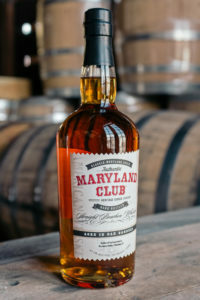 Our Maryland Club Straight Bourbon is made with 51% corn and 49% malted barley. Aged at least three years in new American oak barrels and hand bottled at 95 proof, this whiskey is the color of pale straw, with a palette of floral on the nose with some nice citrus, vanilla and honey notes; turns a little bit herbal on the finish.